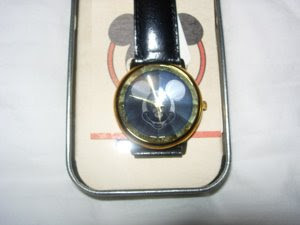 This is a limited edition Mickey Mouse watch, which I purchased at Disneyland around 1994. This watch sold out every time they got it into stock, and it was actually very challenging for me to get this one. Notice the Mickey Mouse face etched into the face of this watch. This watch was part of a limited edition of 3000 watches. I got lots of compliments on this watch, and lots of requests to buy it from me. I actually bought 2 of these watches, and this one in the picture is the one that I never wore.